2017 is going to be a challenging year. 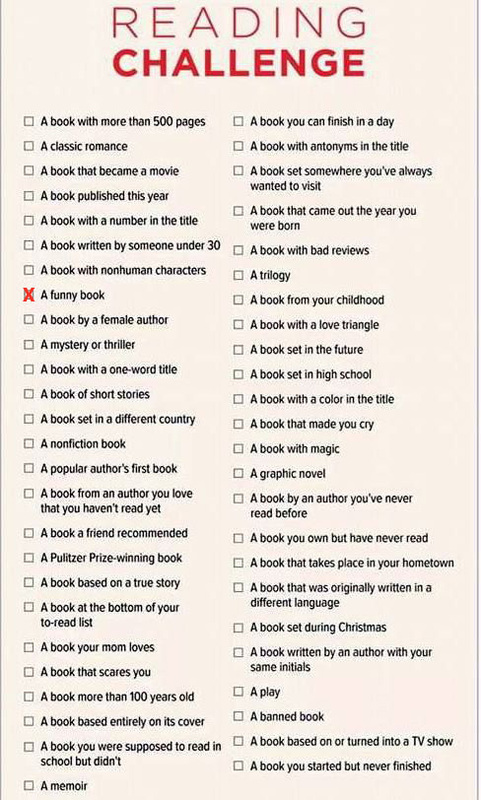 You can take that politically, metaphorically, or however else you like, but more specifically I'm talking about my reading challenge and this new boardgame challenge that I am about to tell you about. You can also go here if you're impatient, or if you would like to do a boardgame challenge yourself. Before I talk about the boardgame challenge though, I'd like to do a quick update on my reading challenge. For my first book I decided to do something easy and cross "a book you started but never finished" off the list. Because what could be easier than reading a book that's already halfway read? So to that end I picked up Good Omens, by Neil Gaiman and Terry Pratchett, which I had started a few months ago but never finished. And I have to say, I wasn't that impressed with it. I don't know if my expectations were too high or if perhaps there is something wrong with me (I feel like you have to take a moment and wonder that about yourself when you're critical of something that is as beloved as this book). While I did think it was funny in places I never found it to be hilarious, and most of the time I didn't think the book was as clever as it thought it was. The book was written well and a pleasant enough read, it just missed the mark for me. For the record, I am a fan of Gaiman's work which is why I picked this up in the first place, but I have never read anything else by Pratchett so maybe that was the problem. I hope not, because someday I'd like to perhaps pick up a Discworld book and see what that's all about. At any rate, that's one book in the books! But I decided at the last minute not to count this as "a book you started but never finished," because I think there is another book on my shelf - one that I started years ago and never finished - that would be more appropriate for that category. So instead I've decided to count this book as "a funny book," because it is that, even if I didn't think it was as funny as thousands of other people do. That's one category down and forty-nine to go, for those of you keeping score at home. I feel like this is a more daunting task than I realized. I'm less than three weeks in to the new year and already I've fallen behind by only reading one book. I should be reading right now! This list demands almost a book a week, and I don't know where I'm going to find the time - with all the boardgames I'm going to be playing! Hopefully the challenge itself will be more exciting than this table I threw together. I hope to play each game on this list at least ten times this year, for a total of 100 boardgames played. I don't for a minute think I'll accomplish this, but I'm keen to see what sort of progress I do manage to make. Those of you who are still reading this may have noticed that there is already a meeple in place indicating that I have already played a game on my list - good eye! That's because I've been planning on doing this challenge since Friday, couldn't post anything until today, but actually played Pandemic Legacy yesterday (we won). In truth, Pandemic Legacy may very well be the only thing on this list that gets completed, due to the nature of that particular game. 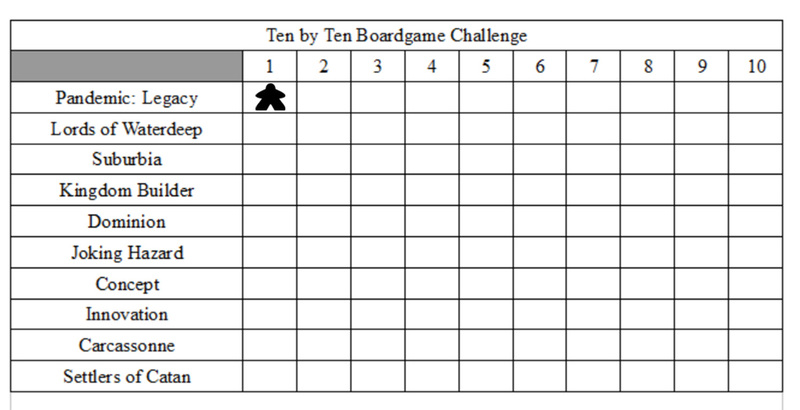 When making this list, I realized that I don't have that many games relative to a lot of boardgamers. Ten games is about one-third of my collection, and that's including things like Pictionary and Jenga. So when deciding what games to play, I started with some of my newer games that I would like to make a real effort to get to the table this year. Then I tossed in a couple of party games because we tend to play a lot of Concept around here (Concept may actually be the favorite over Pandemic to get 10/10 plays) and if we get to play Joking Hazard ten times this year then that will probably mean we had ten really fun nights. The bottom three games on the list are favorites (don't hate) that don't get played nearly as often as they use to, and if I'm challenging myself to play more games then why not play more of the games that made me fall in love with playing boardgames in the first place? I fully expect both of these charts to be mostly empty by the end of the year, but even still I think there will be more books read and more games played than last year. And that's the point, isn't it?